“Green” buildings—buildings that use fewer resources to build and to sustain—are commonly thought to be too expensive to attract builders and buyers. But are they? The answer to this question has enormous consequences, since residential and commercial buildings together account for nearly 50% of American energy consumption—including at least 75% of electricity usage—according to recent government statistics. This eye-opening book reports the results of a large-scale study based on extensive financial and technical analyses of more than 150 green buildings in the U.S. and ten other countries. 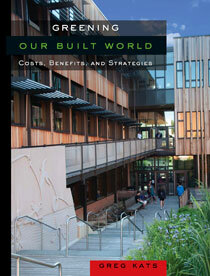 It provides detailed findings on the costs and financial benefits of building green. According to the study, green buildings cost roughly 2% more to build than conventional buildings—far less than previously assumed—and provide a wide range of financial, health and social benefits. In addition, green buildings reduce energy use by an average of 33%, resulting in significant cost savings. Greening Our Built World also evaluates the cost effectiveness of “green community development” and presents the results of the first-ever survey of green buildings constructed by faith-based organizations. Throughout the book, leading practitioners in green design—including architects, developers, and property owners—share their own experiences in building green. A compelling combination of rock-solid facts and specific examples, this book proves that green design is both cost-effective and earth-friendly. "Everyone who is serious about climate change should get this book. Greg Kats brings a deep knowledge of energy and construction to show that the benefits of green construction outweigh the costs and could jump-start a national revolution toward the use of renewable energy sources." "By every measure, green building is an idea whose time is now. Kats' ongoing work in this area is part of the reason, and this book will be an invaluable resource to builders, cities and companies on why and how to cost-effectively green their own built worlds." "Building green offers the potential for important health and economic benefits. As our nation faces the twin mandates to improve health and control costs, analyses such as this one— including full benefit accounting— are indispensable." -What is a Green Community?